I'm currently working on personnal developments around BI and I needed a little NAS to store everything. Finally, last week, I chose the Digitus one. A really nice piece of hardware. 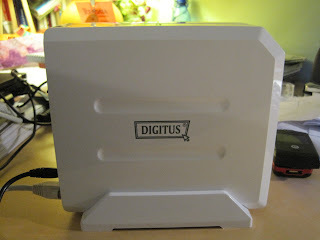 I think Digitus is a German company. 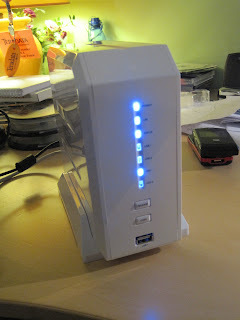 Dual USB2 plugs and special features to copy from usb to internal disks. I also bought two SATA disks with 1 To. These two disks are now in Raid 1 (mirror) in order to secure all my data. Speed is good, both with reading and writing. I just tried to open and use a vmware virtual machine from this NAS and everything worked well. 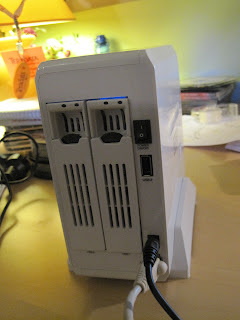 The NAS is provided with an external PSU and is not very noisy (ok to stand on a corner of my desk).